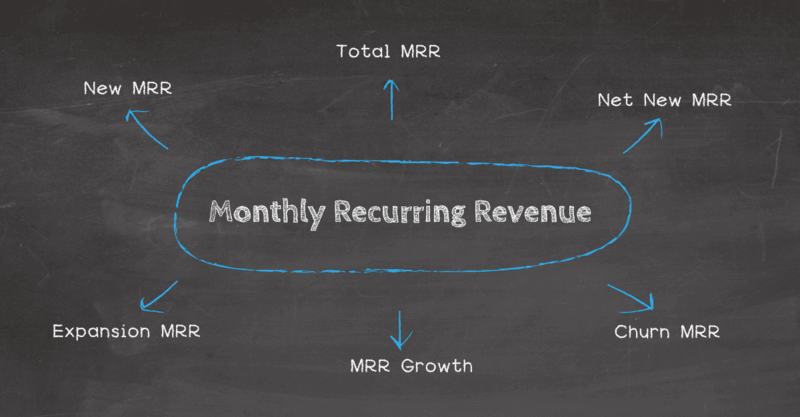 Monthly Recurring Revenue (MRR) is the power plant of any SaaS business. It’s what drives its growth and makes it stick out among other business models. In subscription-based SaaS businesses you don’t have to worry about one-off sales that may or may not return. If you keep your competitive edge, the revenue will automatically return every month. This and other advantages of the SaaS model make increasing number of companies turn to services built on shared online infrastructure. A Research and Reports study reveals that the SaaS-Based enterprise application software market is forecasted to grow at CAGR (Compound Annual Growth Rate, that tells you what an investment yields on an annually compounded basis) of +17% by 2023. Concerning the emerging SaaS industry, it is estimated to generate $55 billion in 2018, and to grow to $76 billion by 2020. We’ve already published a blog post on the top 5 SaaS KPIs every successful SaaS company needs to track to monitor its progress. Today we will focus on the most important of them. It is the truest form of visualizing the subscription cash coming into your business from your customers. In today’s post, we will explain what exactly the monthly recurring revenue is, and what aspects must be included in its calculation. Subsequently, we will warn you against the most common mistakes and give you a few hints on what can be done to improve your numbers. Download our short handbook detailing the what, the why and the how! What Is The Monthly Recurring Revenue? It is a critical financial metric which gives you the most accurate status checkup of your SaaS company. It explicitly accounts for the “recurring” components in your subscription model and helps to make accurate financial forecasts on the basis of users’ subscriptions. Now you can predict what will be the state of your business in the future and design your business strategy accordingly. No other KPI can give you more accurate information as to whether your business is developing and gaining momentum; month-to-month returns speak for themselves. What Are The Benefits of A SaaS Model? Creating MRR streams can achieve a steady cashflow, which would be a better safeguard for the company’s bottom line than a fluctuating, project-related business. Having a predictable revenue helps in budget-forecasts and objectives, and paves the way for growth. Indeed, when a model is scalable, once a customer is locked into a subscription/monthly payment, the business can expand faster. Likewise, the risk is clearly reduced. It is also easier to expand to foreign markets, as your product is an internet-based application you do not need middle-men to distribute it. The only thing you need to market it globally is an internet connection and a good strategy! For SaaS companies, the time to benefit is reduced, as the prototyping is very fast. The software is indeed already installed and configured, and the user can provision the server for the cloud and quickly have it ready for use. Since most of SaaS companies offer free trials, it allows for fast and easy proof of concepts to the prospect, as well as a direct entry into the discovery phase. It really helps in onboarding the prospect easily and demonstrating the added-value, benefits and unique selling proposition of the company. The fact that the software is accessible via browsers that are familiar to the users makes the learning curve softer and adoption rates higher. Businesses with a recurring revenue also tend to have a higher customer retention than those who don’t. How come? Often enough, the hardest part lies down to making a sale – with subscriptions, it’s like having a little sale every month. You just need to keep the customers satisfied and engaged with your products and services, as it costs five times more to acquire a new customer than to retain one. This is why you also need to be familiar with customer satisfaction metrics, in order to maintain a solid customer base that you will steadily grow. Besides, with that already-existing customer base bringing in regular income, you can later on increase your sales by selling them upgrades, add-ons, expansions and other perks that will generate higher profits. Once again, using specific customer KPIs will help in the matter: lifetime value, churn rate, acquisition costs… They are all complementary to the monthly recurring revenue and will guide you. How Do I Calculate My Monthly Recurring Revenue? However, this customer-by-customer method is rather tedious and time-consuming. The calculation drags, because customers pay different amounts as they use different product packages from your portfolio. You can simplify the process by calculating average revenue per unit / account (ARPU). In this case you multiply the total number of paying customers by the average amount all of those customers are paying you each month (ARPU). For example, when you have 100 customers paying an average amount of $100 per month, your recurring revenue would be $10,000. How Do I Leverage My Results? It is simply the new revenue brought by new customers. So imagine that in a month you have acquired 40 new customers paying $100 per month and 20 new customers paying $150 per month. Your New MRR for that month would be $7000. In a subscription-based SaaS company, existing customers often upgrade their product packages or buy additional features as a result of cross-selling. Expansion MRR is the additional recurring revenue from existing customers who decided to expand their package. So when you have 10 customers that upgrade their package from $100 a month to $200 a month, this means your expansion MRR for that month would be $1000. Churn is the recurring revenue you lose because of customers cancelling or downgrading their packages. So let’s say on a given month you had 2 cancellations of $100 a month plans and other 2 customers downgraded their plans by $100 each. Your churn will amount to $400. Consequently, your recurring revenue for the next month will decrease by $400. The dashboard above displays a model development of all the previous metrics. We see that the company is continuously generating new recurring revenue by acquiring new customers. Additionally, growing rate of expansion MRR suggests that the company does a good job in upgrading customers and persuading them to invest more in their products. Churn MRR results remain at the same low level which indicates that customers stay satisfied with their products. What Are Common Mistakes With That Calculation? Although the whole process might seem very clear when broken down into simple steps, we know from experience that there are certain mistakes that keep coming back. Let’s list them here. The subscription value in these calculations should be divided by the intended subscription length even if somebody pays you the total sum in the first month. Otherwise, the calculations are pointless, as they don’t reflect the growth momentum of your business. Calculate the cash flow in your bookings calculations instead. Subtracting transaction fees and delinquent charges leads to misleading monthly results. Some entrepreneurs might want to do that to be more accurate in their calculations. However, at the end of the month delinquent charge is not noted because you didn’t collect the subscription from the customer. What you should do instead is grouping your delinquent charges in a separate category. In this way you can accurately monitor and measure the amount of revenue you lose each month due to failed or expired credit cards. One-time payments like set up fees that you don’t receive on a regular basis don’t belong simply because they aren’t recurring. Adding such payments to your calculations would give you unrealistic growth expectations. Although this explanation might sound redundant and obvious, let’s repeat it for the sake of clarity. If you give a client who pays $100 a month a discount, so that he pays $50 less, your recurring revenue isn’t $100 a month – now it’s $50 a month. Not including the discounts would cause your numbers to peak and would skew your growth predictions. Do not confuse the recurring revenue with cashflow, sales or revenue. You cannot use it to calculate your profit, because it is not accurate enough and normalized so as to remove fluctuations. The only time your recurring revenue will match your real revenue is when all your customers arrive on the first day of every month, that you do not give any refund or discount away, and only sell subscriptions. Now that you now know exactly what the monthly recurring revenue is and you can calculate it correctly, let’s consider what can be done to improve it. Some of the following hints will be somehow stating the obvious, but those are the ones that really work. Have a high quality product with a clear Unique Selling Proposition (USPs). Take your time to consider which features of your product constitute its specific benefit, the one that make your product stick out among the competitors. Don’t just pitch an IT solution with technical specs (often to a non-technical audience) – tell them how it will positively impact their business. Productivity increase, costs control, risk reduction… Find what are their needs that your solution can address. Then clearly communicate these features to your potential customers. And while you’re at it – why not putting on your consultant hat, and give them precious advice about security, mobility, which platform they should implement or integrate, etc. 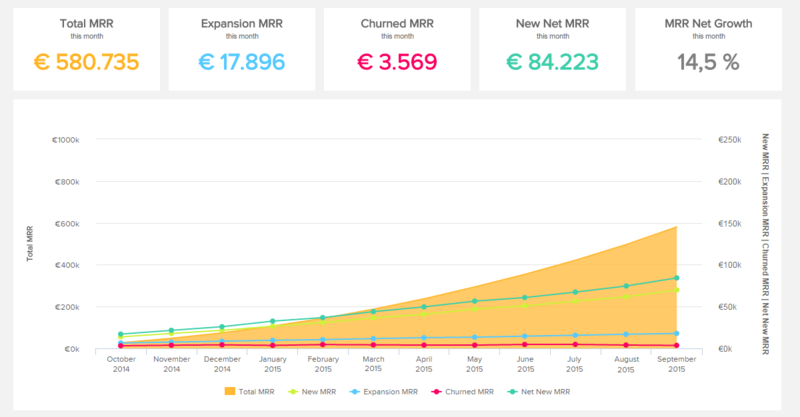 Have a good upgrade strategy to improve recurring revenue through expansion MRR. Discover the potential that lies in your existing customers and upgrade them to an enhanced product package. There’s a lot of money to be grabbed off the table from current customers and often it’s easier to upgrade a customer than to acquire a new one. If you are offering all of your awesome features in one single package, you certainly are missing some opportunity to make more money. Splitting them out into different add-on services will bring the cash in, as the brand-monitoring company Mention did – and saw a 296% increase in their APRA (Average Revenue Per Unit). Starting a yearly pre-payment plan can dramatically increase your customer retention, as they will commit to 12 months directly. Of course, to make it attractive, you will need to offer a discount for that yearly pre-payment option – but the reduction in churn could still yield a net gain in your monthly recurring revenue over a customer’s lifetime. Make sure your customers stay attached to your product. Encourage them by introducing new features. Adding new features on a regular basis, especially to your bigger pricing packages, will not only support your upgrade strategy, but will also prevent your customers from downgrading their current packages. Take care of your customers and stay connected to them. Offer individual customer support and keep customers up-to-date via newsletters and social media channels about new added features. Happy and satisfied customers are the best advertisement you can have, and will be loyal customer hence increasing the lifetime value. “The ability to accelerate monthly revenues while decreasing monthly burn is the number one thing I look for in a growth stage business.” – Steve Schlenker, Managing Partner at DN Capital. This metric is the purest measure of your revenue in a SaaS business, indicating how your momentum is building or waning over time. The easiest way to monitor your monthly recurring revenue is to visualize it on a clear and actionable dashboard like the one above, to get the full picture of the various recurring revenue we discussed and see how each is evolving and how you can improve them. To do so, using a dashboard designer is of great help. If you want to build meaningful data visualizations that help you to draw insights from your data and make better business decisions – start your free trial today!